Slovenia is characterised by great natural diversity, because of the range of geological conditions, the diverse uneven relief and the fact that the country has continental, alpine and sub-alpine climates. Due to its geographical position and uneven relief, Slovenia is influenced by the Mediterranean, the Alps and the Pannonian Lowlands. Because of the varied climatic conditions, a highly diverse vegetation structure can be found in the relatively small area of Slovenian forests. Most Slovenian forests are found within the area of beech (44 %), fir-beech (15 %) and beech-oak (11 %) sites, with a relatively high productivity. Sites of thermophile deciduous trees and pines, covering only about 12 % of Slovenian forest area, have reduced timber production. In Slovenia, only 71 tree species (10 coniferous and 61 deciduous) grow naturally. In Slovenia forests have been influenced by humans less than in most Central European countries because of the mountainous character of the country and the difficult access to Karst region. Hence, there is a high percentage of less accessible forests, relatively well protected, which is proved by natural tree species diversity and forest structure (vertical and horizontal). However, it has been proved that the actual tree composition differs greatly from the potential vegetation. The ratio between coniferous and deciduous trees is 48:52 (2000), while the potential ratio for these site conditions is 20:80. The difference between actual and potential share of spruce is due to spruce planting in the distant past. Spruce was to a great extent introduced into deciduous sites (mainly beech sites). In the 18th and 19th century, forests structure and species distribution was greatly changed due to large scale felling and planting of spruce. Pine has become a typical tree species of the Slovenian Karst. It was planted there in the second half of the 19th century in order to reduce the impact of the strong "bora" wind and to turn the barren rocky karstic landscape into green again. High diversity of habitats and biotic communities that have developed through years has formed many different ecosystems in the relatively small Slovenian country and numerous animal species have thus found a home. Above all, many amphibians and mammals are linked to forests. Slovenian forests are home to 950 plant species (47 of which are endangered) and 70 mammals (25 of which are endangered). 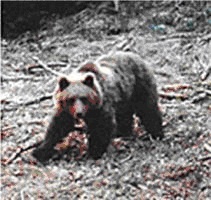 Brown bear has first found shelter in the region of Kočevje and Notranjska – still its main habitat – since 1889. 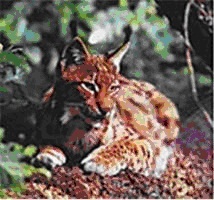 This did not happen with lynx which became extinct and was later reintroduced. Slovenia is one of the few European countries in which we can find brown bear, wolf and lynx.